Please join the National Capital Vegetarian Association at our next vegan potluck for dinner on Sunday, March 18, 2018! Set-up starts at 4:30 pm, and the potluck itself runs from 5:00 to 7:00 pm (please try to come a bit earlier than 5 pm so that you can set out your dish!). The potluck will be held in the party room at 101 Richmond Rd in Ottawa. Please note that the room capacity is 30 people. Please be aware that there have been changes in how much it costs to attend: to attend the potluck, it is now FREE for NCVA members, FREE for all children (whether they are a member or not) (accompanied by an adult), and $5 for non-member adults to attend. You can purchase an NCVA membership ($20/year) online, or at the potluck, in order to have the $5 fee waived. All are welcome! Please bring a vegan dish (that is, containing no meat, eggs, dairy/cheese, honey, or any other animal product) that serves 5 (or more) people, along with a serving utensil and a list of the ingredients in your dish. And don’t forget to bring your own plate, cutlery, and beverage! There is no need to RSVP in order to attend, but if you want to RSVP/share the event with your friends on Facebook, you can find the Facebook event page here. NCVA December Potluck on 17 December 2017 at Noon! Please join the National Capital Vegetarian Association at our next vegan potluck on December 17, 2017! This potluck is for lunch, and it runs from 12:00 to 2:00 pm. Just like last time, the potluck will be held at the new location— the party room at 101 Richmond Rd in Ottawa. Please note that the room capacity is 30 people. To attend the potluck, it costs $2 for NCVA members, $3 for non-members, and $1 for children to attend. All are welcome! Please join the National Capital Vegetarian Association at our next vegan potluck on June 24, 2017! 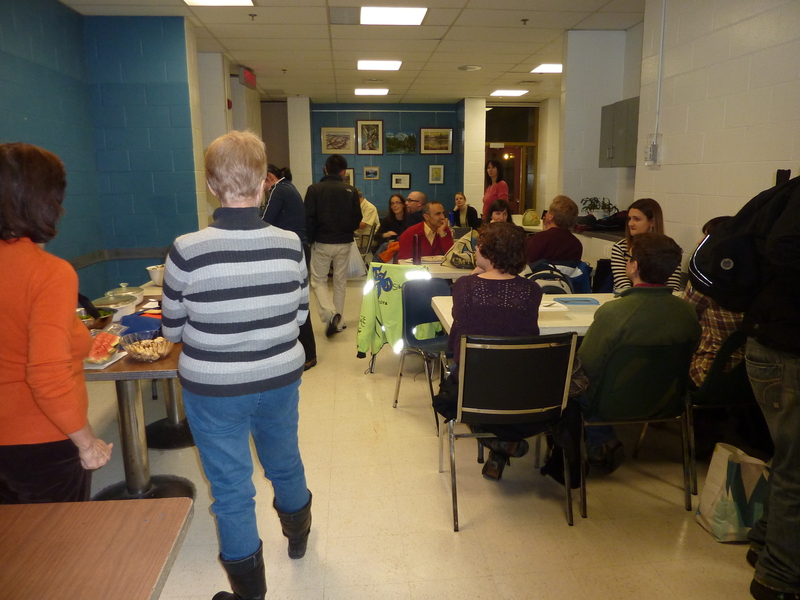 The potluck runs from 5:00 to 7:00 p.m. Just like last time, the potluck will be held at the new location— the party room at 101 Richmond Rd in Ottawa. Please note that the room capacity is 30 people. It costs $2 for NCVA members, $3 for non-members, and $1 for children to attend. All are welcome! Join us at our next potluck on April 29, 2017! Please join the National Capital Vegetarian Association at our next vegan potluck on April 29, 2017! The potluck runs from 5:00 to 7:00 p.m. This time, the potluck will be held at a different location— the party room at 101 Richmond Rd in Ottawa. Please note that the room capacity is 30 people. It costs $2 for NCVA members, $3 for non-members, and $1 for children to attend. All are welcome! Hello everyone! Mark your calendars– on December 10, 2016 (just over a week from today! ), we will be holding our next vegan potluck. 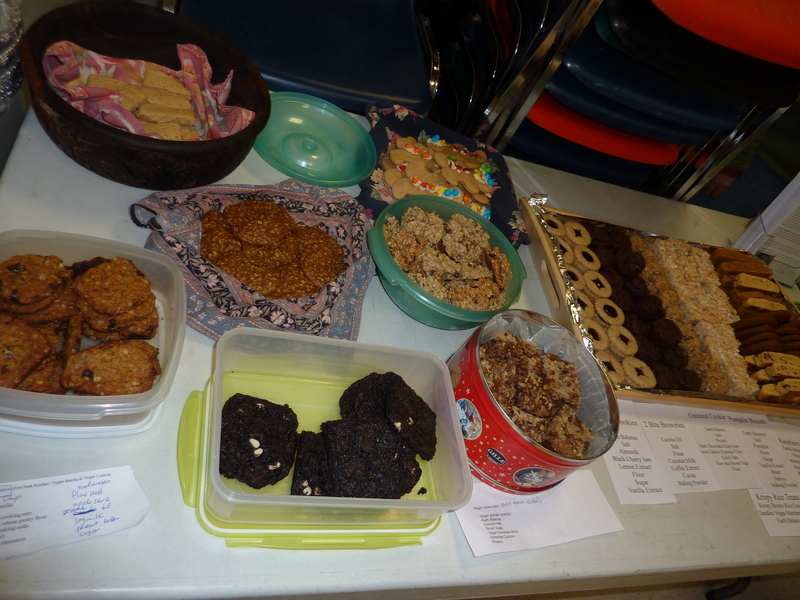 The potluck runs from 4:30 to 7:30 p.m. at the Jack Purcell Community Centre in Ottawa. It costs $2 for NCVA members, $3 for non-members, and $1 for children to attend. All are welcome! These details can also be found on this event’s Facebook Event page. Thanks to everyone who came out to tonight’s potluck and cookie exchange. We got off to a bit of a slow start. The potluck officially began at 6:30, but by that time there were only about 10 people there. More slowly trickled in, however, and by 7 or so, I’d say we had a good 40 people. Highlights of the evening? Hmmm….I got to try vegan mac and cheese for the first time. Well, the homemade stuff anyway. I made a boxed version once and Neil was so traumatized with revulsion that I’ve never attempted to make it again. Neil, of course, wouldn’t try it – even when I told him that Salad in a Steakhouse had made it (sorry, David, I started calling you that and now I can’t stop). Neil’s faux steak and stout pie, of course, was a big hit. It’s even better now he’s making it with the Nelakee mushroom beef instead of the rather gelatinous PC fake beef strips. There was a dramatic late run on the buffet table when it was discovered that late arrival Harpreet had clandestinely added some homemade potato pancakes to the buffet table. A big shout out to Harpreet for bringing something so awesome on her first time out, by the way! On the weird side, the dessert table this time out was filled entirely with apples. 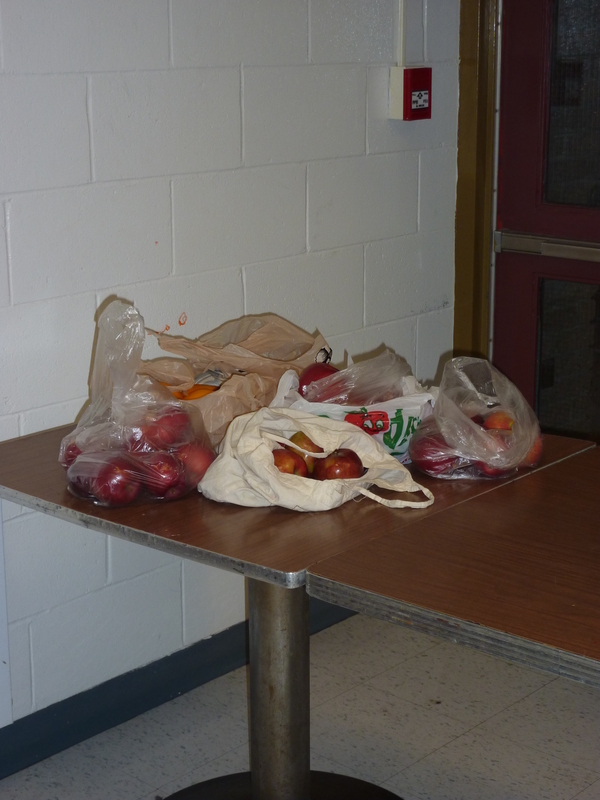 Seriously, there were something like five separate bags of apples, and no other desserts. That was pretty great actually. Of course, it was quite providential that the dessert pickings were slim, since today was the day of the cookie exchange. We sold quite a few 6-cookie bags to our dessert deprived attendees. 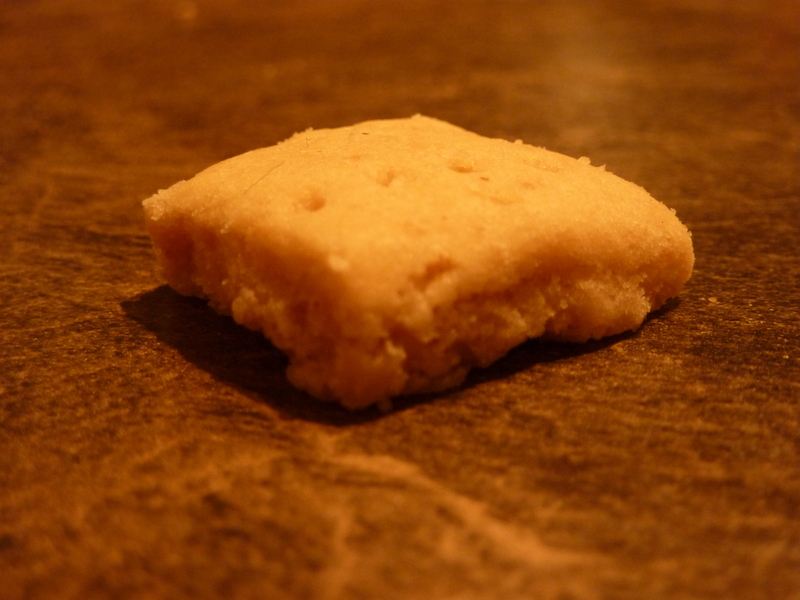 Who made that fabulous shortbread, by the way – these little squares with the fork holes? Because they may well be the most fabulous things I have ever eaten in my life. Anyway, thanks again all. Hope to see you at the East Africa Meetup!